Changing how you present food to your kid can make a big difference to your child’s acceptance of that food. 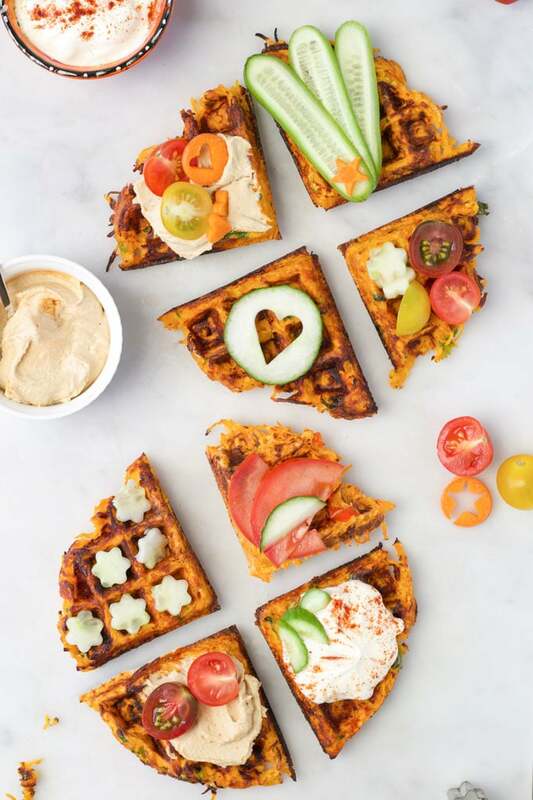 These Savoury Waffles are a great way to get your kids pleading for more vegetables! I’ve named this dish “Savoury Waffles” simply because I’ve made them in a waffle machine. However, they aren’t your traditional decadent, doughy waffle. Really they are just a vegetable fritter in disguise. As you can see, from the picture below, the mixture is made with very little batter. I’ve used half a cup of flour in this recipe but, in the past, I have managed to get away with using only a quarter. 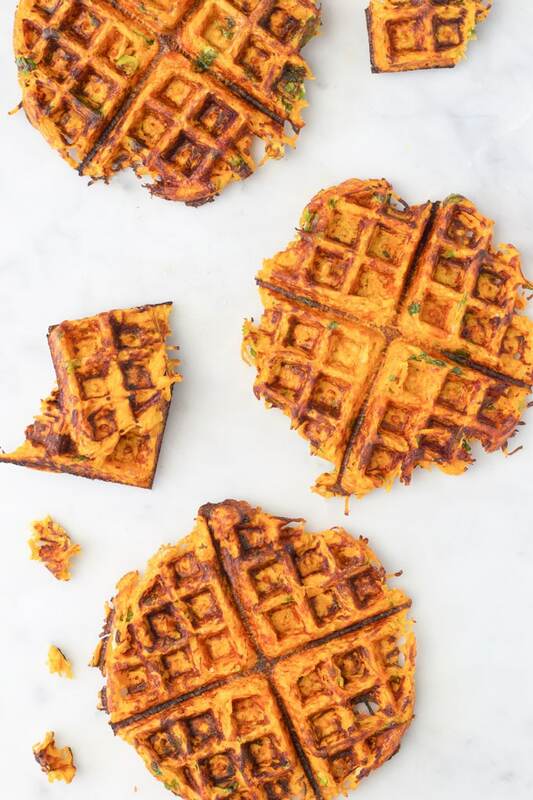 Having less batter, I believe, allows more of the sweet potato and carrots to be in contact with the plates, cooking them better. You can also make them with white potatoes, if you prefer, and add any herbs and spices to suit taste. I recommend squeezing out the juice of the vegetables if you are adding different / more vegetables. The mixture will be too wet if you don’t do this. I usually place the grated vegetables on a clean dish cloth and squeeze until all the juice comes out. NOTE: Don’t throw away this juice, it is full of goodness! I usually add it to pasta sauces, chilli, bolognese etc. You could also add it to smoothies. pop them in a lunch box. This is a great finger food for babies, I would recommend reducing the cheese or simply eliminating it, to reduce sodium levels. 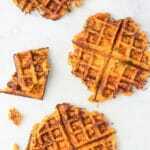 Young babies, doing baby-led weaning, will find the waffles easy to grip due to the textured surface. I love serving vegetables in different ways. If you do to then why not try my savoury muffins, carrot and parsnip fritters, noodle baskets, carrot and sweet potato fries, cauliflower tots and rainbow fritters. Looks great thanks. Which waffle machine are you using ? I need to buy one and would like one that’s reliable. Thanks! Hi Michelle, I got my one in Aldi (one of their specials). The brand is Ambiano, I find it works really well. I actually just made these in a normal frying pan, pressing the mixture down and then flipping. They tasted great and my girls really liked them. You don’t need a waffle machine. These turned out great! Thanks for all your amazing recipes! Will this recipe be suitable for freezing? Thanks Jay, so happy they worked well for you. Yes these freeze well, my son has actually had them in his lunch box several days this week (he loves them!) . I pop them in frozen and they are defrosted for him by lunchtime. Hi Amy, do you think they’ll work with gluten-free flour? Hi Sonia, I haven’t tried this recipe with gluten free flour so can’t say for sure, sorry. I’d love to know how it goes if you try it. Is there an egg substitute I can use in this recipe? Hi Aarti, I haven’t tried any egg replacements in this recipe so can’t say how they would turn out. You could try using a chia or flax seed egg. Looks delicious can’t wait to make these! What are the little star/flower things on the last picture? Hi Fleur, they are cucumbers. I just used a tiny cookie cutter to cut the shapes 🙂 Hope you enjoy! 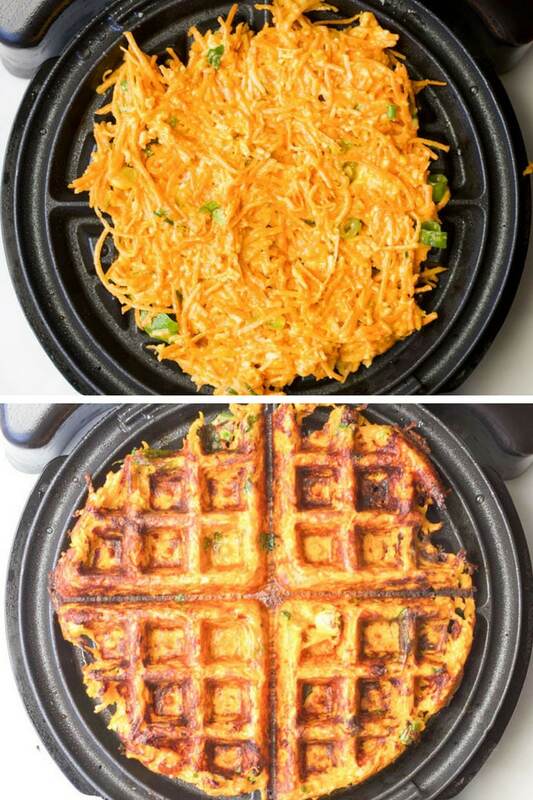 what a great idea to make a savory waffle, never tried one. I would not only like to make these but intrigued on the flavors they must be fabulous! Thank you, Claudia! 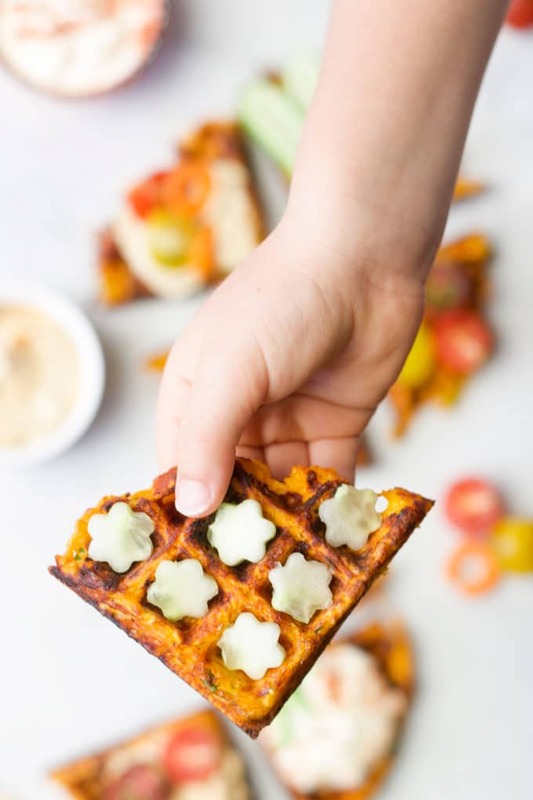 My kids love these, mainly because they are made in a waffle shape! Thanks for a great recipe, very versatile, served with avocado/tomato/coriander/jalapeño salad and bioled egg slices with sour cream on top. Delicious breakfast!!! I use GF flour and works well. Thanks so much for the feedback. So happy you liked the recipe and I’m loving what you served it with, sounds delicious!